Eyebrows design Microblading in Barcelona. 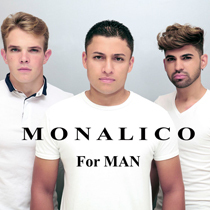 Beauty salon Monalico is a specialized centre proving, the capital of Catalonia. We are aimed at making you always feel beautiful! Eyelashes extension and eyebrows design Microblading in Barcelona. Beauty salon Monalico is made to make your look more expressive, to deepen or widen your eyes visually and to create really perfect shape of your eyebrows. Those who are dreaming of thick, long, curled eyelashes and who are tired of doing make-updaily are suggested one of our salon services – individual eyelash extensions. We also provide another service. It’s the eyebrows design (threading). This procedure is equally suitable for men and women. We’ll add beauty to your look by making it individual and unique! ¡Haremos su mirada individual e irrepetible! 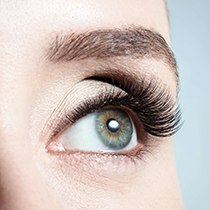 The technique of one-to-one eyelash extensions is that in each of your natural eyelashes without touching the skin, a synthetic eyelash with a special hypoallergenic glue is glued. What are the individual eyelash extensions? It’s one of our professional salon services. The technique of individual eyelash extensions is based on applying synthetic eyelashes one by one to each of your natural eyelashes with the help of special hypoallergenic glue, without touching skin. The amount of eyelashes applied depends on the thickness of your natural ones. Synthetic eyelashes can be of various length and thickness.They can be curved to any extent and made of different materials. 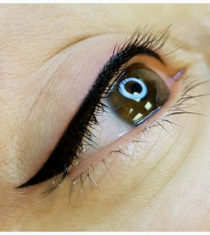 Semi-permanent eyelashes would fall off one by one during 4 or 6 weeks. And to make your eyes look perfectly any time it is we recommend to get a refill of eyelashes after 2-3 weeks. Refill applications take between an hour. The effect of eyelashes extensions. You won’t need any mascara! If your eyes are big, they’d become especially emphasized after eyelashes extensions. And round eyes will look slanting (the so-called effect of the “cat’s eyes”). Tired eyes will get fresh look! You’ll get long, black and thick eyelashes. And you will be able to run your usual way of living: visit a gym or a swimming-pool, travel and be ALWAYS the icon of beauty! Threading or epilation with use of a thread is an effective way of removing undesirable hair. Why just a thread? Just with the help of a thread it is possible to get perfectly straight eyebrows line. This procedure also has more lasting effect if compared to other methods of epilation. We’ll consider your face oval, eyes shape and even hair colour. Then within 30 minutes you’ll get the ultimately fitting design of eyebrows. Good-looking neat eyebrows of a regular shape will give perfection to your appearance and make your look much more attractive and impressive. Only general introductory information is written on the page. The most detailed difference in materials is explained by the center specialist. Taking into account your wishes and the state of your eyelashes, we will help you choose the type of eyelash that best suits you.